2. 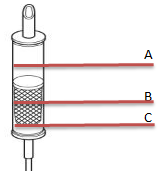 Which of the following requires transfusion through Filtered Blood Tubing (select all that apply)? 3. A patient has accidentally received packed red blood cells through a standard primary IV tubing. What potential complication of this error should the nurse be aware of and report to the primary care provider? c. Administering packed red blood cells without a filter can cause the accidental infusion of a blood clot or debris. 4. To be effective, blood should be primed to the following landmark. (Please select from the diagram).